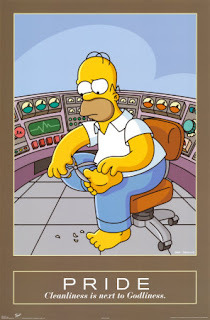 Homer's Guide to Healthy Living..
..work in a nuclear power plant. "It's safer to work in a nuclear plant than it is in real estate," says Patrick Moore, a scientist and founding member of Greenpeace who began supporting nuclear energy several years ago. He cites data from the U.S. Bureau of Labor Statistics, and notes that a Columbia University study published in 2004, which followed 54,000 nuclear-plant workers for 15 years, found that they had fewer cancers, less disease and lived longer than the average person. "If you honestly believe that greenhouse gas is the seminal issue of the day, as world population and economic growth continue to expand, so will the need for electric capacity," says Sheila Slocum Hollis, a partner at the Washington law firm of Duane Morris who specializes in energy law. "Whether to power electric vehicles or for general manufacturing needs, ultimately people are looking toward nuclear as the big power source." Exelon and other operators have addressed the problem of nuclear-waste disposal with "dry-cask storage" -- high-tech sealed containers that they keep on their sites. Due to innovations like that, many of the safety concerns that arose after accidents at Three Mile Island in Pennsylvania in 1979 and Chernobyl in Ukraine (then part of the Soviet Union) in 1986 have eased. "Nuclear power is in a renaissance," says Tom Neff, a physicist and research affiliate at MIT's Center for International Studies. In fact, 17 applicants are seeking government approval to build 26 nuclear plants, meeting a Dec. 31 deadline for federal tax credits and potentially ending a 30-year hiatus in the construction of new U.S. nuke facilities. I trust we'll all be driving to work in nuclear-powered Humvees rather than prissy Priuses. It's greener too!